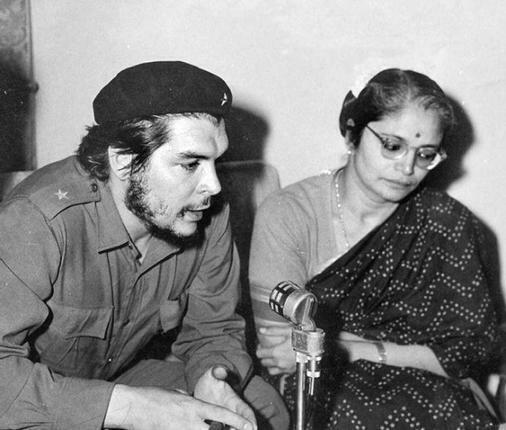 Ernesto Che Guevara’s impressions of India, recorded after a visit in 1959.These memoirs might not go well with present day people who call themselves communists , wear tshirts with images of Che guevara and conducts beef fest in Kerala out of hatred for hindus. This small, almost funny change, however allows the freeing of enormous quantities of dried cow excrement, ill-used as fuel, to be used instead as fertilizer. With a loving effort, children and women knead the bovine excreta, putting it to dry under the sun and later forming enormous pyramids of several metres high, quite like huge anthills. Thanks to the efforts of the Indian government, they shall now have their own little kerosene stoves and will fertilize their soil with that important product. One can quite understand that the cow was a sacred animal for the ancient ones: it worked in the fields, gave milk, and even its excreta had the enormous importance of replacing natural fuel, which does not exist here; this explains why their religious precepts prohibited the farmer from killing this precious animal and, for that, the only way out was to consider it sacred; to have such a determining force as religion impose respect for the most efficient element of production which the community counted on. Years, however, went passing by and turned into centuries, and now, in the age of mechanical plough and liquid fuels, the sacred animal continues to be venerated with the same fervour, and it multiplies freely with hardly anyone committing the sacrilege of eating its meat. One hundred and eighty million cows is what India has, almost 100 million more than the United States, which is the second producer in the world, and Indian leaders apply themselves to the terrible problem of making a people, religious and obedient to cultural commandments, cease their veneration of the sacred animal. In Calcutta [now Kolkata], a premier city of India, six million human beings live crammed with an incredible number of cows that pullulate the streets, interrupting the traffic each time they feel like reclining right in the middle of the street.